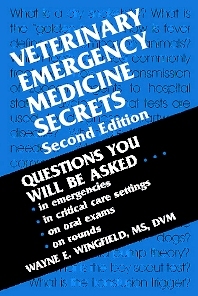 The fact that all veterinarians see emergencies on a regular basis, and the increasing importance of emergency medicine and critical care in veterinary medicine, have helped make this one of the best-selling books in The Secrets Series® and in veterinary medicine and critical care. Dr. Wingfield is one of the preeminent authorities in this field, and the new edition is completely revised and updated, featuring a number of new authors, with new chapters on disaster medicine and the transfusion trigger. Critical care management of dogs and cats are also covered.